The Live Action Heroes are coming to rescue your party! No matter how big or small your special event, they will deliver! Though somewhat of a secret in the Bay Area, members of the Live Action Heroes have been performing all over the USA and beyond. They have shared the stage with the likes of Huey Lewis, John Denver and Vince Gill. One member is still occasionally sittin' in on shows with the Beach Boys. But now, the Live Action Heroes have decided to settle down and focus on becoming the most in-demand dance band on the central coast. Every one of these Heroes is a long-time, veteran of the music scene, yet all still carry a youthful exuberance and infectious energy that will get you and your guests up on their feet, out on the dance floor and having a blast all night long! 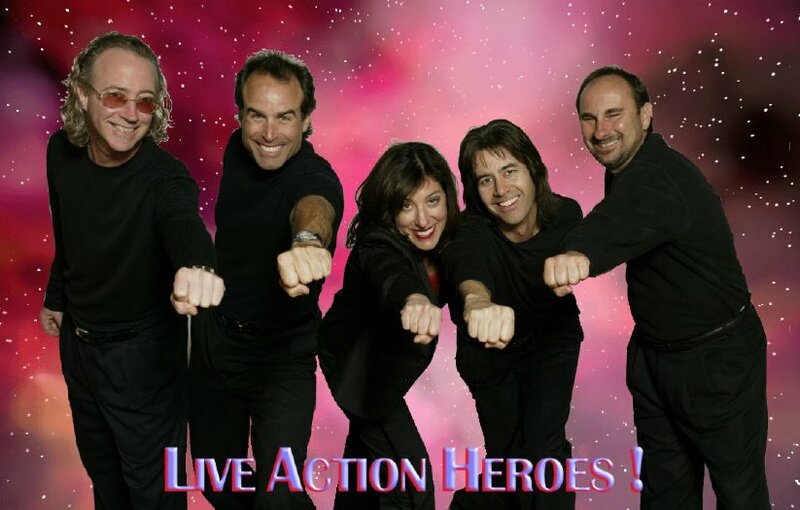 Professional and versatile as they are fun, working with theLive Action Heroes is always a breeze. They're just as comfortable performing a smoothly elegant jazz standard as they are laying down a slammin' funky dance groove. The Heroes always deliver a sparkling night of music featuring the favorites of Motown, Rock 'n' Roll, Disco, Country and Pop. From the Beatles and Aretha thru Donna Summer and Abba and on thru Pink and Shania, the high energy fun just keeps comin' at ya! ... and a non-stop mix of everyone's favorite dance music! So come on now ... Who ya gonna call?